Calling All Romantics... Make Your Valentine's Reservations at the Melting Pot! Calling All Romantics... Make Your Valentine&apos;s Reservations at the Melting Pot! Hello there folks! Jerm here with an update for you on something that is just too awesome to be true (but it isn&apos;t)! If you haven&apos;t already done so, be sure to go ahead and start making those reservations at Tampa Bay dining locations so that on Valentine&apos;s Day you won&apos;t be stuck like chuck out in the cold because you didn&apos;t plan ahead! 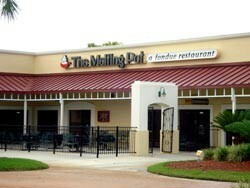 One way to definitely with regards to making that reservation is to call the Melting Pot of Tampa Bay! It doesn&apos;t get more romantic than Fondue folks, and as you can imagine these reservations will fill up fast. As a matter of fact, according to my sources they have already done so! But have no fear as there are a few more spots left, but don&apos;t be a procrastinator for too much longer or you may miss out! The fine folks over at the Melting Pot have even decided to open up at noon on Saturday the 12th, Sunday the 13th and Monday the 14th! So you have plenty of opportunities to book your reservation, but be sure to take full advantage of it! Now for those of you that chose to continue reading to the bottom of this post, I have a special surprise for you! For February 14th, we have secretly made a reservation for 2 people at 5:45 that afternoon. Why You ask? Because we will be doing a trivia giveaway tomorrow for a chance for two lucky people to not only have that reservation (because they will be sold out), but for those two people to have a $125 gift card to cover the cost of a 4-course meal! How awesome are we exactly! So there you have it folks, be sure to get those spots reserved as they are filling up fast. Word on the street is that some of the only spots available are for the noon-3 p.m. range so get to booking! That&apos;s all I got for ya for now folks, but be sure to check back in tomorrow and play along for your chance to win! And as always stay in the know about Tampa Bay area events from us here at your Tampa Bay team of blog giveaway ninjas!